Radon is probably the most confusing and unknown topics when it comes to the home inspection process. I want to make this easy so let’s break this down. Radon is a colorless, odorless, radioactive gas that is produced by decaying uranium. Some form of radon is present in nearly all soils and low levels are even found in the air we breathe every day. Now, even though that sounds like something from a Star Trek galaxy, it truly is something to think about and be concerned about if there are high levels of radon in the soil around the house you are considering buying. Once radon leaks from the ground into the air it has a half-life of four days. Half of the given quantity of it breaks down every four days and when it undergoes this radioactive decay, it can emit ionizing radiation. The problem occurs when radon gas enters the home and gets trapped. Long-term exposure from this radon can cause certain types of cancers. According to the EPA, radon exposure can kill up to 21,000 people every year. So what do you do about it, how does testing work, and what happens if you want to buy a house that has high radon levels? The EPA, Environmental Protection Agency, recommends that all properties, regardless of whether or not they are in a radon zone, be tested for radon during the home inspection or purchasing process. Radon testing is usually requested by a potential buyer as part of the home inspection, even though it is sometimes a separate service. If the radon test is 4 pCi/L or greater, the EPA recommends the buyer negotiate with the seller to have a radon mitigation system installed to bring the radon level lower. The pCi/L lever is expressed in pico curies per liter of air. A curie is a unit of radioactivity equivalent to 1 g of radium and pico means trillionth. Should I get radon testing? Because the radon is found just about everywhere, it can be difficult to know when to get testing. 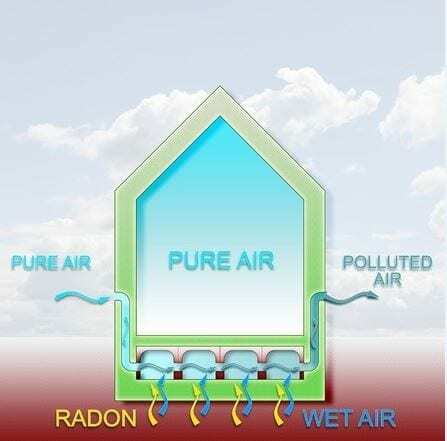 In today’s energy efficient, airtight homes, radon can be pulled inside and trapped in the house causing health issues. But each home is different. The EPA website includes a map of radon zones, 1 being the highest predicted indoor radon screening levels. Your real estate agent should be able to tell you what zone the house are willing to purchase is in. However, it can be almost impossible to know without proper testing. Just because the house is not in a high-level zone doesn’t mean there couldn’t be radon in the soil or in the air, so additional testing is always recommended. It’s really just peace of mind. Short-term testing can evaluate radon concentrations over about a 24 hour period. Radon levels can fluctuate so testing over several months is often the most accurate, however, most homebuyers don’t have that luxury. Inspections should be completed within a day or two. Short-term testing can be completed with simple charcoal based or electret ion device that can measure radon levels for 2 to 7 days. The results must be mailed to a lab for testing. Long-term testing for 90 days or more should be completed with the device acquired through state radon agencies and online retailers. Ongoing radon testing can be electric monitors and digital meters that plug into a standard outlet. These can both be used for short-term and long-term testing to give you an idea of the radon levels in your home at any given time. What if the inspection reveals high levels of radon? If the levels of radon register 4 pCi per liter or higher, a second test should be done at another time to verify the results. This will give you the most accurate results unless the first result was a 8 pCi/L or higher. If the radon levels are too high, a modern radon mitigation system can bring indoor radon levels below 2 pCi/L. If the level is only slightly elevated, simple repairs such as caulking foundation cracks, construction joints, and other openings can reduce the radon levels. Sellers can install an airtight cover on a sump pump and cover soil in crawl spaces with polyurethane plastic sheeting tightly attached to the walls. Ceiling concrete may also be a temporary solution. However, if levels are still high, a radon mitigation system is really the best option. This system ventilates the house by using PVC piping to draw a radon gas up from the soil and out of your house. A vent pipe is typically placed in the sump pit or a whole made under your concrete floor slab. A radon fan is installed in the attic or outside the house to draw air through the vent and from under the house. Additional: How to remove radon from well water? Hiring a professional to install a radon mitigation system can be a few hundred dollars up to a few thousand dollars depending on the system, the levels, and where the installation occurs. Although this sounds a bit scary, it’s not something to overreact about. Serious effects result from exposure to high levels over a long period of time. If you find a house you currently live in or are buying has radon, it doesn’t mean you need to freak out right away. 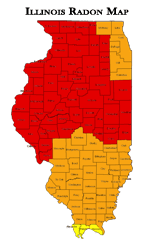 Simply talk to your state agency about radon testing, mitigation systems, and professionals that deal with this type of exposure to find out the best option for your budget, your health, and your house.